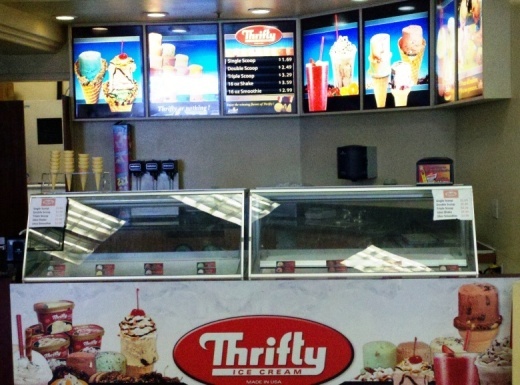 I recently stopped by the Las Posas Car Wash, 100 South Las Posas Road, and noticed something new...Thrifty Ice Cream! The last time I was there I believe they were serving up Haagen Dazs. Thrifty, which is also available at most Rite Aid Stores (and there are currently 16 of them in Ventura County and adjacent cities), is a local brand that goes back over 70 years. It was first produced in Hollywood in 1940 and since 1976 has been manufactured in El Monte. Mmmm...always loved Thrifty Ice Cream at Thrifty Drug Stores. A single scoop at the car wash is $1.69, which is reasonable enough...though I seem to recall a scoop costing about a quarter or so back in the day. Am I getting old or what!